Once again, we’re on the eve of a new expansion. Tonight, many of you will be logging in and starting the grind from 90 to 100. For the first time in a long time, many of you will actually be doing it in protection spec. But regardless of how you get there, at some point you’ll hit level 100 and want to know how to optimize yourself for raids. When patch 6.0 dropped on live servers, I posted a Survival Guide focused on what has changed at level 90. This post is the complement to that, containing details on how things change at level 100. Some things are obviously the same, like the stat squish and changes to abilities, so I won’t be going over them again. I’m only going to talk about things that I either haven’t covered in that post, or have changed significantly from level 90 to 100. You may recall that I made a qualitative post about our level 100 talents a little more than a month ago. Now let’s look at them qualitatively. Below are the results of a multi-actor simulation containing a bunch of paladins with slightly different L75 and L100 talents. The specs should be easily inferred from the names, but there are a few minor tweaks I should explain. Empowered Seals gives you a fairly wide range of options. For example, you can sit in Seal of Insight for maximum survivability, or you can ignore Insight and twist Truth and Righteousness for maximum DPS. Twisting all three seals gives you a middle-of-the-road option, which is what the default APL is set up to do. So to give a proper representation of Empowered Seals, I’ve added “_DPS” and “_SUR” actors. The “_DPS” actor twists Truth and Righteousness to maximize DPS, and the “_SUR” actor just sits in Seal of Insight to get maximum survivability. However, that’s also not terribly fair to Seraphim and Holy Shield. After all, you could swap to Seal of Truth while using either of those talents for a significant DPS boost. So to show that, I’ve added two “_SoT” actors which use Seal of Truth, but are otherwise identical to their companion actor (e.g. SS_SW_Sera_SoT is identical SS_SW_Sera except for using Seal of Truth). With that out of the way, let’s look at the data. DPS rankings for different L100 talents. TMI rankings for L100 talents. Holy Shield performs pretty well in these sims. It gives the best baseline survivability of the three by a slim margin. “Survival mode” Empowered Seals can match it, but at a hefty cost of around 3000 DPS. That said, it lags in single-target damage a bit compared to either of the other two options. It will lag even further if you spend time not actively tanking things. Seraphim performs very well. With Seal of Insight, it produces higher DPS than the other talents (including the default Empowered Seals APL) at a small TMI cost (around 3k). With Seal of Truth active, it’s the flat-out highest DPS talent available. And the on/off nature of the buff can make it strong for tank swaps, provided the timing is right. I think the balancing of these two talents is pretty solid. Neither is head and shoulders above the other, and both perform close enough to one another that they’re both perfectly viable. Seraphim gives you a little DPS edge when played perfectly, and gives you more control over when you get that DPS, but takes more concentration and makes you a little squishier while the Seraphim buff isn’t active. Empowered Seals though… well, in short it just doesn’t keep up. It’s versatile, but that versatility doesn’t seem to pay major dividends. You can sit in “survival mode” at a large DPS cost, but your survival is no better than if you took Holy Shield. Likewise, you can sit in “DPS mode,” but you’re actually about 1k DPS behind using Seal of Truth with Seraphim. The benefit is supposedly that you can do this all within a single encounter, without changing specs. But I think you’re probably actually better off with Holy Shield in that situation. Switching to “survival mode” costs you a large chunk of DPS compared to either of the other talents, but while in “dps mode” you’re only about 1000 DPS ahead of Holy Shield with Seal of Truth active. Unless you spend about 2/3 of the fight in “dps mode” and only 1/3 in “survival mode,” you’ll actually produce more DPS and have better survivability by just taking Holy Shield and swapping from Seal of Insight to Seal of Truth based on what you care about at the moment. In other words… Holy Shield does seal twisting better than the “seal twisting” talent does. Take Holy Shield or Seraphim. Holy Shield will be a solid choice on most encounters, especially cases where you have to tank multiple targets at once, and has the benefit of taking literally no attention away from the encounter. This makes it a perfect choice for learning a new boss fight, since you can pay more attention to the encounter mechanics that you need to learn rather than micromanaging your rotation. Once you have the mechanics down, you may decide to shift gears to take Seraphim if the encounter suits it. It gives you better burst DPS, and more control over the timing of that DPS. Be aware, however, that the longer you delay Seraphim, the less effective it is. The DPS gains may disappear if you’re not casting it at regular 15-second intervals, so this talent is much more susceptible to sloppy play or mismanaged timings. Also remember that you’re most vulnerable in the ~5 seconds before you re-apply Seraphim, because you need to be pooling Holy Power during that period to recast it. This is a good time to use Divine Protection, especially with Unbreakable Spirit talented. Another trick you can use is to sit on a Divine Purpose proc and consume it during that 5-second window, since you can’t use it for Seraphim anyway. If you really enjoy seal twisting, it doesn’t hurt much to take Empowered Seals. It just isn’t really overly strong in any particular category, and it’s hard to justify the extra attention required to maintain multiple seal buffs. I could see this talent being more effective if we had a much emptier rotation, like some of the other tank classes now have. But without culling some of our rotational spells, that just isn’t going to happen. You’ll note that I only used Sacred Shield in these sims. You can see the version with Selfless Healer and Eternal Flame included here. It doesn’t really add anything though – EF and SH are uniformly worse for TMI, and the small DPS gains that you achieve by not spending GCDs refreshing Sacred Shield aren’t really worth it. One of the big changes is in our stat priorities. If you recall from the Survival Guide, at level 90 mastery was king, with bonus armor right behind it, and then versatility, haste, and critical strike rating trailing a little behind. The gap between the stats was not that large though, and even the lowest stat (crit) was still 2/3 the value of mastery. All of that changes at level 100 though. Ten levels and a bunch of gear upgrades make a pretty big difference, but there are plenty of other factors that affect the stat weights as well. For example, at level 90 it took 20 haste rating to increase your haste by 1%, compared to 23 rating for crit or mastery. At level 100, it’s now 100 haste rating vs. 110 crit or mastery rating, which should weaken haste relative to the other two stats. Level 100 talents can also have a fairly significant effect. Holy Shield favors mastery slightly because you’re blocking spells now, and the reactive damage adds to mastery’s DPS contribution. Seraphim and Empowered Seals will likewise favor certain stats more than others. TMI scale factors for the T17H profile. Let’s analyze these results in a little more detail. Bonus Armor is head and shoulders above everything else in this sim. It’s just flat-out awesome, giving solid effective health against physical attacks and increased healing by increasing your attack power. Stamina and Strength are also strong. Stamina’s value is obviously dependent on how much you have and how willing you are to trade survivability for DPS, so YMMV there. Strength performs well thanks to granting a combination of AP and parry. Mastery commands a solid lead over the remaining secondary stats. Unlike at level 90, where it had several stats nipping at its heels, the next closest secondary stat is nearly a full 30% weaker. That said, this sim is using Holy Shield, which makes mastery a little stronger than usual. Crit and Versatility are roughly tied for the next place. The order in which these two show up depends a lot on the specifics of your gear, though I think that versatility tends to be a little stronger overall. This is one of those things you’ll just have to sim for yourself if you want more accuracy for your own character. Multistrike and Haste bring up the rear, with multistrike generally leading haste. Also note that this is a solo sim, so the effect of Shining Protector is underrepresented compared to a real situation. How much is one of those subjective questions that is hard to answer. I’ve left off armor and stamina since they’re not something we can actively choose in most cases, but the numerical values are there in case you want them. In addition, note that the gear set I’m using here is already heavily biased towards mastery. In other words, even in a high-mastery gear set, stacking mastery instead of other secondary stats is a solid bet for survivability. At level 90, haste had finally managed to catch up to mastery once you stacked 55%-60% of it. It’s possible we will once we have T18+ gear and higher mastery percentages, but we’re not there yet in T17. DPS scale factors for the T17H profile. The obvious take-away here is that strength and bonus armor are great. They’re also two of our best TMI stats, which is convenient. With Holy Shield selected, mastery gets a slight edge over versatility, haste, multistrike, and crit, but they’re all pretty close to one another. Obviously stamina and armor provide no DPS contribution, hence they come out as zero (or close enough to it, within error) in this plot. TMI scale factors for the T17H profile with Empowered Seals selected. TMI scale factors for the T17H profile with Seraphim selected. On the Empowered Seals plot, mastery drops a bit compared to armor, as does strength. But both still command a healthy lead over the remaining secondary stats. Versatility swaps places with crit, but otherwise the order is basically unchanged. Seraphim works a little differently, in that mastery’s value drops, falling in line with the other secondaries. There’s a fairly good reason for this, which I mentioned a little earlier in the post. While Seraphim is up, you’re in very little danger, because you have lots of excess stats. But your most vulnerable time is the 5-second window right before you recast Seraphim, while you’re pooling holy power. That’s where your big spikes come, and unfortunately, that’s a period you are almost never covering with Shield of the Righteous, taking a lot of the wind out of mastery’s sails. We’re also simming with a very mastery-heavy gear set, which further reduces mastery’s value. 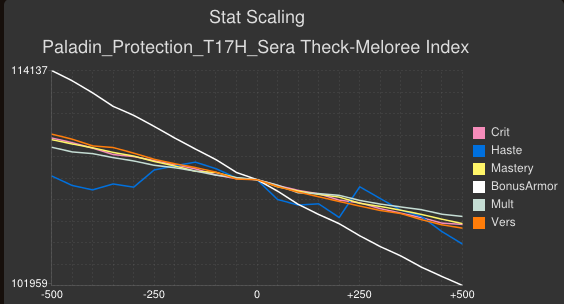 Stat weights after re-optimizing the T17H gear set using Seraphim. Suddenly haste is back in the spotlight! How does that even work? This highlights one of the major problems with calculating stat weights. This sort of calculation is based off of the assumption of linearity. In other words, we assume that the increase due to each stat is extremely linear, such that our quick sampling accurately reveals the overall trend. Scale factor plots using T17H gear set and Empowered Seals. Scale factor plots using T17H gear set and Holy Shield. Since we’re looking at TMI, the stat that has the largest negative slope on these plots is the best, because it reduces TMI by the most per point. Both of these plots tell the same story that the scale factor bar plots did: bonus armor is far and away the best stat, followed by mastery, and then followed by the other secondary stats, which all clump together. Scale factor plots using T17H gear set and Seraphim. Kind of crazy! We see some of the features shown on the scale factor bar plots. Bonus armor is still awesome, and mastery is now back in the clump of other secondary stats. But the haste plot is all over the place, making it tough to trust values generated from just a single scale factor simulation. What’s happening here is that we’re hitting haste breakpoints with Seraphim. It’s a little complicated, because it’s a mix of interactions due to the rigid 15-second cycle, the reduction of the GCD, the 5-second lockout period during which we pool HP, and a few other factors. I think that in practice, none of this is worth worrying about, as a real player will make enough errors to smooth this curve out. What you should take away from this graph is that despite haste being much less linear than the others, over the course of the graph it doesn’t actually outperform the other secondary stats. Haste might sim above or below the other secondaries in any single scale factor simulation, but on average it just oscillates around the others as you increase the amount of haste you have. Here’s the associated plot from the alternate gear set, showing the same effect. So in practice, I think that the secondary stat weights for Seraphim should probably just be “Bonus Armor > everything else,” possibly with a slight bias towards versatility and crit since those do seem to consistently outperform mastery and multistrike. DPS stat weights for the T17H gear set with Empowered Seals. DPS stat weights for the T17H gear set with Seraphim. As you can see, both Empowered Seals and Seraphim favor haste, crit, and multistrike a little in terms of DPS. That said, again, we’re in a mastery-heavy set, so this is sort of expected. If you’re using Seraphim or Empowered Seals and want to eke out some more DPS, you can shift itemization into haste, multistrike, and crit and de-emphasize mastery, but the DPS gain isn’t going to be that great. Now that we have stat weights, let’s talk about how this affects our gearing. The stat weight results have some important, if subtle, implications for how we gear. First, note that most of the time we aren’t going to be making tough decisions between gearing for DPS or gearing for survivability. Higher-ilvl gear has more of everything, but most importantly it has higher strength, stamina and armor. This means that a higher-ilvl piece will almost always be preferable to lower-ilvl piece because of the innate defensive boost from stamina and armor, and the boost to everything from strength. Secondary stats are all similar for DPS, so we can almost ignore that aspect and select pieces based on which gives better defensive bonuses. In general, that means taking pieces with mastery on them, but again, it will usually still be a gain to take a higher-ilvl piece without mastery than a lower-ilvl piece with mastery just due to the huge value of strength, stamina, and armor. I say almost above because it’s clear that bonus armor is an outlier here. It’s got a massive lead in both departments. There’s almost no reason you should ever pass up a bonus armor item as a result. Even a lower-ilvl item with bonus armor can trump a higher-ilvl piece without it. Bonus armor is the one stat you should be drooling over and hoarding. Luckily, only other tanks will want that gear, so competition should be low. DPS and TMI results for different trinkets, simulated alone. The top few DPS trinkets are either strength (Horn of Screaming Spirits, Tectus’ Beating Heart, Forgemaster’s Insignia) or bonus armor (Evergaze Arcane Eidolon, Blast Furnace Door, Tablet of Turnbuckle Teamwork). The top few TMI trinkets are stamina trinkets (Pillar of the Earth, Petrified Flesh-Eating Spore, Battering Talisman), but they’re followed closely by the bonus armor trinkets (BFD, EAE, and Pol’s Blinded Eye) and strength trinkets (HoSS, Bottle of Infesting Spores). This is a bit of a departure from what we’re used to. For the first time in a long time (at least for 25-man raiding), there isn’t a huge survivability gain to be had from stamina trinkets. They’re a little better than bonus armor and strength trinkets, but only barely – and they come with a pretty hefty DPS loss. As a result, I wouldn’t be surprised if we didn’t bother using stamina trinkets at all this tier. Of course, the usual disclaimers apply. This sim is only one potential scenario, a TMI boss that does ~75% physical damage, etc. Stamina may shine in an encounter with a lot of magic damage and so on. But bonus armor has really taken a serious run at stamina here, because it provides all the effective-health goodness that stamina does (at least, against physical attacks), but also gives us a lot of DPS. In fact, the bonus armor trinkets are the ones that really shine here. The combination of Blast Furnace Door and Evergaze Arcane Eidolon give you nearly the best DPS possible and almost match the TMI you get with stamina trinkets. If you look at the sim with trinket pairs, you’ll see that the only way to improve DPS over the BFD+EAE combination is to pair a bonus armor trinket with a Horn of Screaming Spirits, and the gain is only about 100 dps. The only way to beat BFD+EAE in TMI is to replace one or both with stamina trinkets, for at best a reduction of about 2k TMI. Obviously you’ll take what drops as it comes and adjust accordingly, but it seems clear that the two trinkets we’ll value most highly are BFD and EAE. And again, as bonus armor trinkets, you won’t be competing for them with your plate DPS guild-mates. It won’t hurt to keep a spare stamina trinket or Horn of Screaming Spirits in your bags to customize your load-out to the fight, but in all likelihood the BFD+EAE combination will be your go-to trinket setup for the entire tier, provided you can get your hands on them. There’s one last gearing point to discuss, and that’s tier bonuses. Unfortunately, there isn’t much to say yet. Preliminary work suggests that both tier bonuses are worth getting, despite the fact that our tier isn’t heavily mastery-itemized. But I haven’t had time to do an exhaustive comparison here, and frankly, that sort of comparison won’t be relevant for at least a month or more thanks to the fact that the Highmaul raid doesn’t drop tier tokens. By the time we actually have access to them, I’ll have results to share. So expect a follow-up blog post on that topic. This is with Holy Shield selected, which gives Alabaster Shield a boost (thanks to Holy Shield). It’s also using Divine Purpose, so Final Wrath may get a little stronger if you take Sanctified Wrath, but probably not enough to catch up to the next two choices (it’s behind by 300-some DPS). Note that you only get a benefit from Double Jeopardy if you’re properly cycling targets the whole time, and Focused Shield is a flat-out DPS loss whenever you can cleave to 2+ targets. The only other thing to mention is that while Immediate Truth is a DPS loss against bosses, it could be useful while leveling. The difference in DPS is small enough that it’s almost certainly a DPS gain if the target doesn’t live long enough to build up a 5-stack of Censure, which is pretty common while leveling. So you may want to consider using that if you’re leveling with Seal of Truth active. Not much has changed here, though I did add a Seraphim cooldown icon. I hope. I forgot to do it on beta, so I had to do it on live, which means I obviously can’t test it. But I will as soon as I get to 100, and it’s a simple icon so it should just work assuming I got the right spell id. As I said last time, I removed a lot of the useless stuff. While I’m not using a Resolve bar, somebody asked for one, so you can find it on the WeakAuras page. That’s pretty much all I have for you today. But I’ve been pretty busy lately, so it’s possible that I’ve forgotten something. Or that you might want to know more about something I mentioned, or maybe something I didn’t mention. So I’ll try to be around most of today to answer any questions you post in the comments. This entry was posted in Tanking, Theck's Pounding Headaches, Theorycrafting and tagged Holy Shield, interface, Min/Max, raiding, rotations, Scaling, simcraft, stamina, tank, tanking, theck, Theorycraft, theorycrafting, TMI, warcraft, WoW. Bookmark the permalink. Are you experiencing any FPS loss from WeakAuras? I was having some horrible FPS issues on Timeless Isle last night that seemed to be alleviated by disabling WeakAuras. Not really. I have some slow-down when I open up WeakAuras because it has to load all of my WA’s for every class. But while running I haven’t noticed any major slow-down. That said, I haven’t been on the Timeless Isle in weeks. What’s your opinion on DP vs. SW? It sounds from the text that you’re pro DP, but the charts only have SW + SoT, no Holy + SoT. I’m guessing its about 23.4k (SW leads DP by about 600 dps for the HolyS + SoI bars). Which if so ranks very nicely. But it would be great to see that bar on the graph. I only put a few _SoT bars on the graph to keep the visual clutter down. Your assumption about it being ~600 DPS behind the SW configuration should be pretty accurate, as the two effects are basically independent. As far as my opinion on them? I like them both. I was running DP for the majority of 5.4.x, and have been running SW for most of 6.0.x. They’re both fun. Pick whichever you like best, unless you have a particular desire to max DPS (SW) or survivability (DP). Hey Theck, I’ve enjoyed following your blog updates for a long time now. I was wondering if you know of anyone that performs this level of analysis for Ret specs? I don’t know of any bloggers off-hand, I usually go to EJ for Ret information. MMO-Champion’s forums might also be a good place, because the guy running the Ret thread (Solsacra) has been submitting a lot of APL tweaks to me, so presumably he’s doing a lot of testing. Nice write-up Theck, thank you for putting it together. A while back, you said Blizzard is aware that haste is underperforming and they aren’t particularly thrilled about it. The stat weights kind of bum me out, because I think haste stacking is a lot of fun. Do you know if they have any plans to help it out? I don’t know what, if anything, they have planned. I’m wondering; how well does EmpSeals match up against the rest if you only twist Truth & Insight ? e.g. If I only switch to Truth to keep up the DoT, that will also guarantee the Emp buff without actually losing much survivability compared to pure Insight. Hi Theck, follower since Cata days and great to see you still around. I’m not sure if you noticed, but a really old trinket has an insane amount of Bonus Armor atm. http://www.wowhead.com/item=18472 if you still have it around, gives 128 bonus armor from a VERY old item. Yeah, I’m aware. But that item doesn’t compete with level 100 trinkets, and isn’t necessarily available to everyone (I disenchanted mine long, long ago). It’s mostly a weird outlier at level 90, which is now sort of irrelevant. Something interesting I just noticed: plug in the TMI weights for Holy Shield for one-handed weapons, and the Garrosh heirloom does EXTREMELY well if you socket it with +50 mastery gems; essential equal to iLevel 665 strength weapons! In other words, if you aren’t going to be killing Heroic Butcher you may not be replacing it until Foundry opens if you are unlucky with weapon sockets. Of course, while wDPS isn’t going to be that important to us it’s not nothing, so the Garrosh weapon is likely a modest dps loss compared to a 665. Still, this illustrates just how powerful sockets are in WoD; for items with budget of a one handed weapon they are worth over 20 iLevels. When I try to put WoD quality gems on my (mythic) heirloom it says that the ilvl is too low for gems of that quality. Yep, I found that out this week too. Apparently they hotfixed it between the last few weeks of beta and now. Did I just interpret holy shield incorrectly, or is it only supposed to do reflective damage on blocked spells, and not on blocked melee attacks? It doesn’t say “when you block spells”, it just says “when you block”, all blocks count, regardless of whether they’re spells or physical. It’s a bug that it doesn’t reflect damage on physical blocks. This is interesting even though as usual I understand about half of it. I’m trying to make a gear comparrison list that I can understand but unless I’m wildly mistaken str and sta are so good the other stats barely matter. For Example, according to my stat weights (which could be totally wrong). TrueSteel Helm > all of the blue 630 helms, even if it rolls the worst and lowest possible stat combo (which would be 106 haste/crit I think), which makes sense as it’s 640 I guess, but is it so marginal that it basically doesn’t matter as long as it has more sta+str or am I misunderstanding the gulf in my numbers. Yep, that’s basically the net result. STR+STA+Armor upgrades are a big deal, not to mention just plain having a larger quantity of secondary stats. I’m still at Level 98, but the thing that’s standing out to me is the synergy of the new talents and stats. There is now a lot of pure, passive damage reduction going on. Improved Block raises your block value to 40%, Holy Shield increases your block chance by 15% and allows you to block spells, Bonus Armor reduces physical damage, Versatility reduces all damage, Mastery increases block chance. That’s all without factoring in SotR uptime. There’s a part of me that wants to take Holy Shield and then stack Mastery and Versatility all over the place to get my passive damage reduction as high as possible. Even looking at other gearing strategies and talent builds, I kind of feel like we’re heading back towards WotLK a bit, and edging away from Active Mitigation (which to me would not be all bad). There is so much damage reduction and avoidance going on (not to mention self-healing) that it seems like the only way encounters will be able to really endanger a tank as the expansion progresses is with massive spike damage. At which point we’ll all go back to being Stamina addicts. That’s just a gut feeling, no numbers involved. The only thing with that is sockets were EVERYWHERE, and now we may be lucky to see sockets. With those sockets and reforging gone,I think it’ll either be everyone plays the same or strictly skill based. Hey Theck! Interesting as always. I was wondering if you have taken into consideration Sacred Duty which gives 5% more haste, when talking about stat priority? Yes, SimC includes that in the modeling. The stat weights and plots all include that 5% increase automatically. What about the avoidance stat? How does it stand w/all this? (assuming you stand in fire vs a specific amount of unavoidable AoE if any). How to decide if to take a 640 item or a 636 with avoidance (or avoidance +socket)? I haven’t run any sims with the avoidance stat yet. I suspect that it’s weak enough that you wouldn’t want to skip a significant ilvl upgrade. You can always sim your character in SimC with each item equipped and see what happens, but i suspect it’ll be a trivially small difference. Sockets should be self-explanatory, in that they’re worth however much stat you get to stuff in them. What about weapon enchants? mastery or armor? Take your pick for now, I don’t have any simulation results to analyze yet. One problem with simming them is that the armor enchant only procs when you’re below 50% health, but by default SimC just lets you sit at negative health forever. That means it will over-value the bonus armor enchant. I need to rig up some fancy stuff to reset the test tank’s health every so often to get a better estimate. In reality though, we’ll have to wait until we have some combat logs so we can compare them to simulations and see exactly how well the modeling works. My suspicion is that the bonus armor one will win for reasons that may not manifest themselves in a TMI measurement, though. But I haven’t looked that closely at the exact proc trigger mechanism for it yet. New changes incoming, is it time to chenge priority? •Mastery: Divine Bulwark now increases Shield of the Righteous’ damage reduction by 0.5% per point, down from 0.75% per point. •Grand Crusader now also has a 30% chance to trigger its effect from Crusader Strike and Hammer of the Righteous. •Shield of the Righteous now reduces physical damage taken by 25% (up from 20%). Is there a new ‘script’ that can help us with gear upgrades? The old script does not take versatility or avoidance into account. So judging if ‘This’ or ‘That’ is an upgrade, in the scene of damage taken, with comparable stats I feel could be smoother than me clicking items on/off and averaging values in my head. I am not concerned with being unhittable. I am just concerned with decreasing damage taken. That script is basically useless now, because combat hasn’t worked that way since Cataclysm. In general, you’ll probably just want to stick with “higher ilvl” as your metric for upgrades since strength, stamina, and armor are so valuable. Trinkets are basically the one exception – try to get bonus armor trinkets there if possible, even if the ilvl isn’t quite as high. Hey Theck, I have been looking around and having a really hard time getting solid info on what the stat priority should be for 6.0.3. Especially what is the deal with haste. Some guides say its the bee’s knees others says its the lowest. I just got one to 100 prot pally (I used to be a blood DK but they are pretty weak right now) Any help would be awesome!